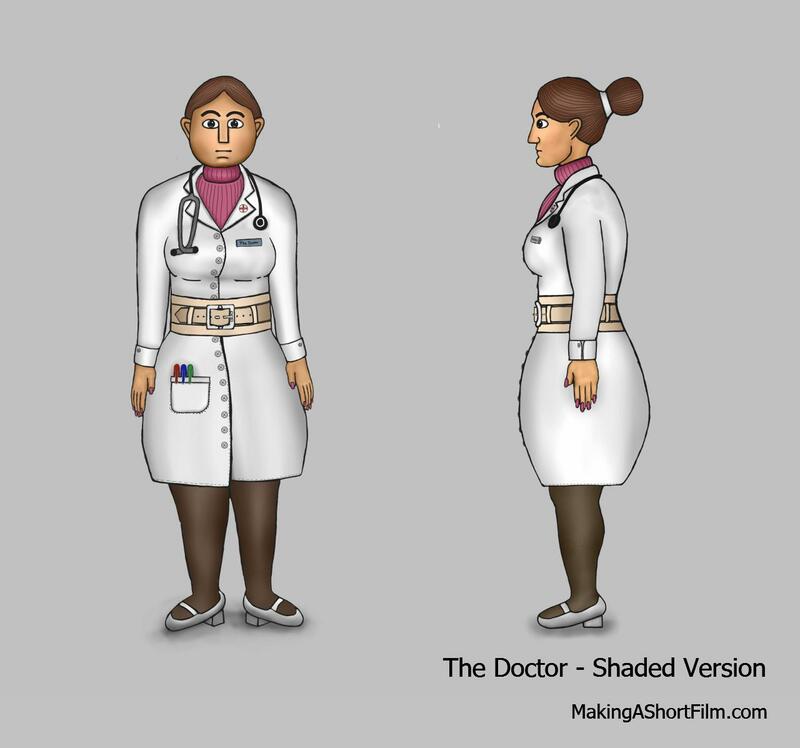 Here she is, the completed Doctor design! Overall, I like the result. She looks strong and firm, but not evil. One thing I was a bit unsure about were her shoes. I do like the way they look, it fits her character, but they look like shoes that make a lot of noise when walking. She has to be stealthy, moving without making a sound. There are two scenes in the film where she "sneaks up on them" without them noticing her at all. She has to be able to come out of nowhere, even if she is not actively trying to sneak. I suppose there are three options here that would allow that to happen. Switching out her shoes, or imaging the shoes having some kind of rubber soles so they are actually silent looking like that. Or perhaps the Robot and the Old Man are just as caught up in the moment that they don't notice her. I think I like the last option the best, only making the characters (and the audience) hear her shoes whenever they see her. This means she would make noises when she first enters the room, since they see that, but not the other times. Only after noticing her, the shoes becomes audible again, giving her a loud sound of authority whenever she walks out of the room again. A person with loud shoes is after all someone who takes a lot of space and is not afraid to be in charge, which I want for her, so I will keep them like this. As for the hair, it is not very realistic. It really sticks out from her head, and the band holding it together is not really pulled tight (unless she has super much hair in the neck). It is a cartoon-style film, but I still think it is a bit too much. I will tweak it more in the finished model, moving the bun closer towards the head and making it flatter. Other than that, I like the way she looks! I think the coloring ended up well, with her reddish sweater really making her stand out in a room. Red is a dangerous color, giving her a kind of alarming feeling, but it is still mostly hidden underneath her white, angle-like clothing, making her look mostly good at first sight. So, this completes the work on the Doctor, and almost the character's concept art in large. However, after giving both the Old Man and The Doctor colors, I feel confident to give coloring the Robot a go as well. So, that's what I will do!